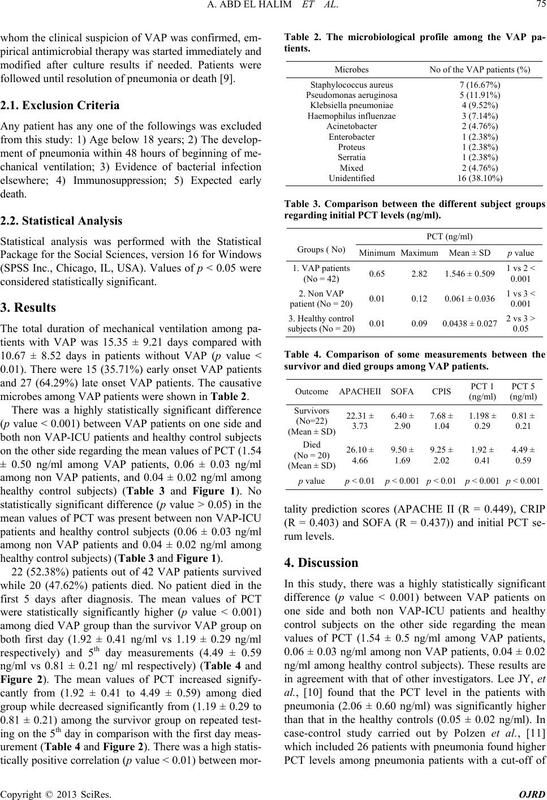 predict the outcome of VAP patients. We recommend other larger studies to augment our findings. *The authors declare no conflict of interest. 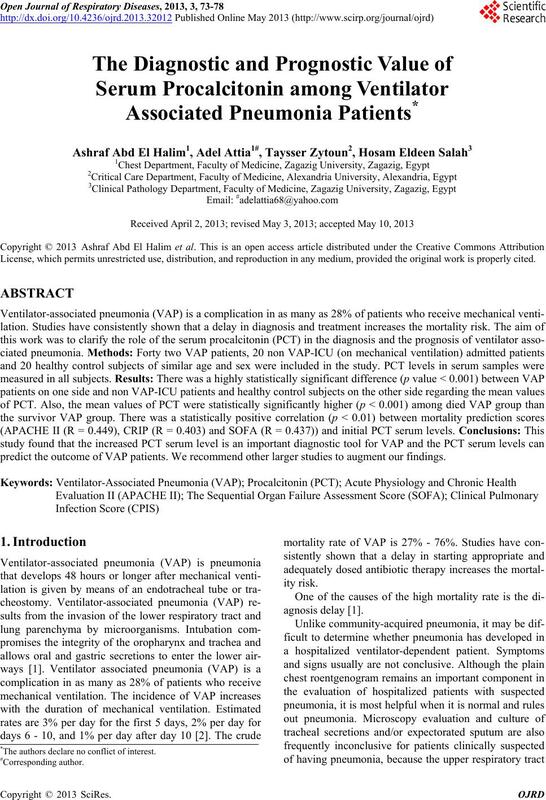 A. ABD EL HALIM ET AL. cialist Hospital, Dammam, Kingdom of Saudi Arabia. mitted at the ICU. The mean age was 58.09 ± 13.07 years. males and 7 (35%) females. 2) Chest x ray examination. (CRP), liver and kidney functions tests. 4) Arterial blood gases analysis (ABGs). (SOFA) was calculated for patient groups only. calculated for patient groups only. on the 5th day of diagnosis. bated before the initiation of the mechanical ventilation. followed until resolution of pneumonia or death . 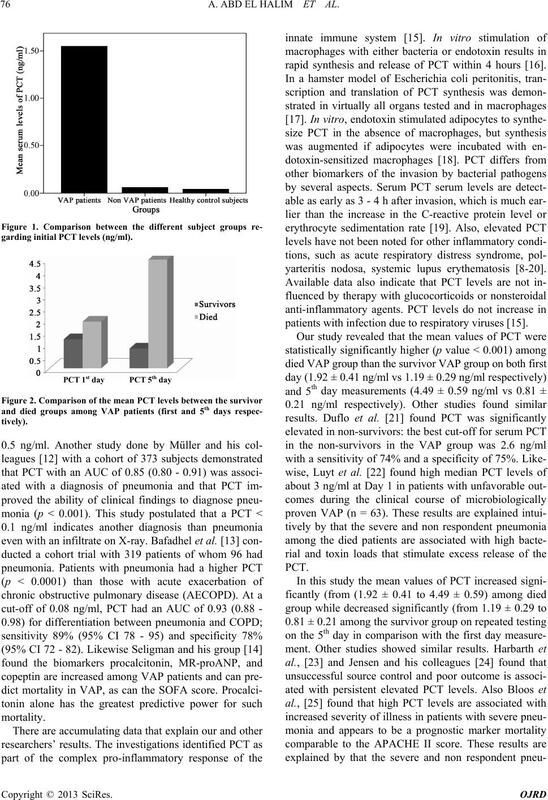 microbes among VAP patients were shown in Table 2.
healthy control subjects) (Table 3 and Figure 1). regarding initial PCT levels (ng/ml). 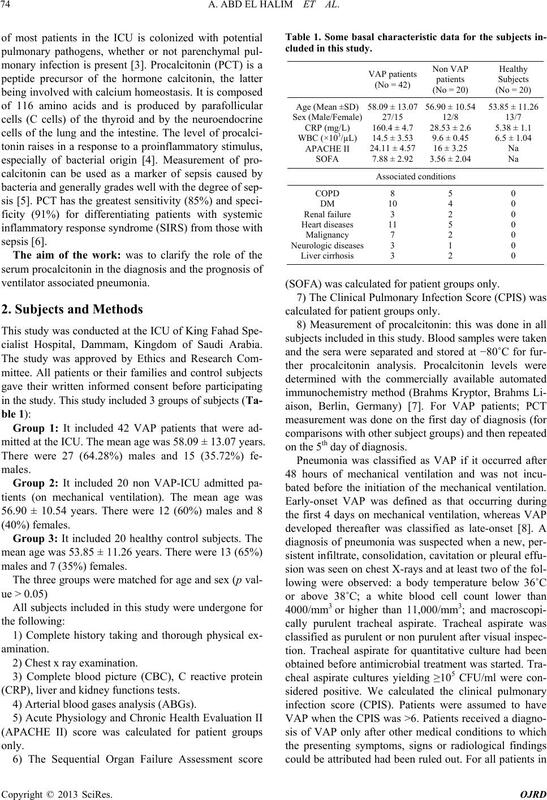 survivor and died groups among VAP patients. garding initial PCT levels (ng/ml). 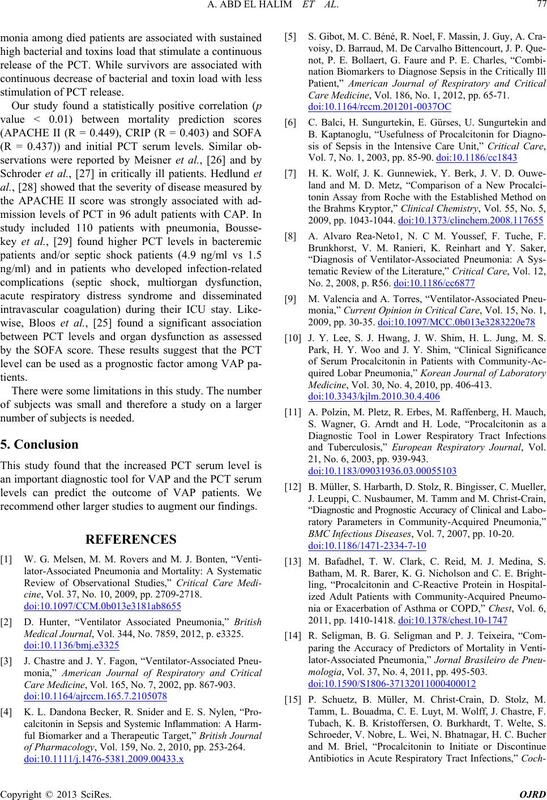 rapid synthesis and release of PCT within 4 hours . yarteritis nodosa, systemic lupus erythematosis [8-20]. patients with infection due to respiratory viruses . number of subjects is needed. recommend other larger studies to augment our findings. cine, Vol. 37, No. 10, 2009, pp. 2709-2718. 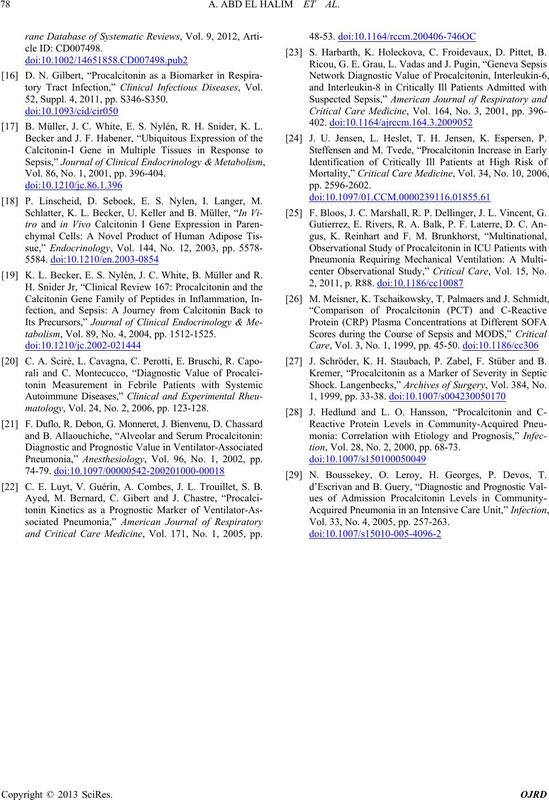 Medical Journal, Vol. 344, No. 7859, 2012, p. e3325. Care Medicine, Vol. 165, No. 7, 2002, pp. 867-903.
of Pharmacology, Vol. 159, No. 2, 2010, pp. 253-264. Care Medicine, Vol. 186, No. 1, 2012, pp. 65-71. A. Alvaro Rea-Neto1, N. C M. Youssef, F. Tuche, F.
 J. Y. Lee, S. J. Hwang, J. W. Shim, H. L. Jung, M. S.
Medicine, Vol. 30, No. 4, 2010, pp. 406-413.
and Tuberculosis,” European Respiratory Journal, Vol. 21, No. 6, 2003, pp. 939-943. BMC Infectious Diseases, Vol. 7, 2007, pp. 10-20. M. Bafadhel, T. W. Clark, C. Reid, M. J. Medina, S.
mologia, Vol. 37, No. 4, 2011, pp. 495-503. P. Schuetz, B. Müller, M. Christ-Crain, D. Stolz, M.
Tamm, L. Bouadma, C. E. Luyt, M. Wolff, J. Chastre, F.
Tubach, K. B. Kristoffersen, O. Burkhardt, T. Welte, S.
tory Tract Infection,” Clinical Infectious Diseases, Vol. 52, Suppl. 4, 2011, pp. S346-S350. B. Müller, J. C. White, E. S. Nylén, R. H. Snider, K. L.
Vol. 86, No. 1, 2001, pp. 396-404. P. Linscheid, D. Seboek, E. S. Nylen, I. Langer, M.
 K. L. Becker, E. S. Nylén, J. C. White, B. Müller and R.
tabolism, Vol. 89, No. 4, 2004, pp. 1512-1525.
matology, Vol. 24, No. 2, 2006, pp. 123-128. Pneumonia,” Anesthesiology, Vol. 96, No. 1, 2002, pp. C. E. Luyt, V. Guérin, A. Combes, J. L. Trouillet, S. B.
and Critical Care Medicine, Vol. 171, No. 1, 2005, pp. S. Harbarth, K. Holeckova, C. Froidevaux, D. Pittet, B.
 J. U. Jensen, L. Heslet, T. H. Jensen, K. Espersen, P.
 F. Bloos, J. C. Marshall, R. P. Dellinger, J. L. Vincent, G.
center Observational Study,” Critical Care, Vol. 15, No. J. Schröder, K. H. Staubach, P. Zabel, F. Stüber and B. Shock. Langenbecks,” Archives of Surgery, Vol. 384, No. tion, Vol. 28, No. 2, 2000, pp. 68-73. N. Boussekey, O. Leroy, H. Georges, P. Devos, T.
Vol. 33, No. 4, 2005, pp. 257-263.